AR is technology that allows us to digitally enhance our surroundings in real time, combining sound and computer-generated visuals with what we are actually seeing. Currently most applications of the technology require some sort of wearable, usually a headset or ‘smart glasses’, which then show the digital imagery over the top of our actual location. Usually the first thing people think of when asked about augmented reality is its uses within the gaming industry, however we are now seeing more and more companies prove that AR is also a really useful tool for business and retail. In the last few years many retail chains have really picked up on how AR can increase customer engagement. For example, children’s toy giant Lego have used AR in stores which allowed shoppers to hold up a box of Lego and see the completed model as if they had it in their hands. We have also seen American Apparel make use of augmented reality in their clothing stores. Shoppers can download a smartphone app that enables them to point their phone at an item of clothing and see it in other available colour options. They can also view reviews and other product details in the app, and buy the desired item in the app if the store doesn’t have their size in stock. Some companies are creating augmented reality applications that consumers can use from the comfort of their own homes. IKEA developed a catalogue using augmented reality to allow buyers to see how furniture and other items would look inside their home, without the need to measure room space. The app shows the real size product against a room, and then the user is able to make a decision and place an order – without having to visit an IKEA store. Likewise, the Converse Sampler iPhone app enables customers to try on shoes using the camera in their phone. All the buyer has to do is download the app, point their phone at their leg, and then they can buy the pair they like through the app. Another potential use of AR is workplace training. Using augmented reality allows us to create surroundings and simulate working situations in which staff can learn new skills without having to leave a safe environment. For example, Dr Homero Rivas at Stanford University in the US has trialed using Google Glass and augmented reality in surgery. With an app called MedicAR, Dr Rivas is able to locate a target on an anatomical human model and see the step by step procedure illustrated over the top of the model, through his Google Glass. 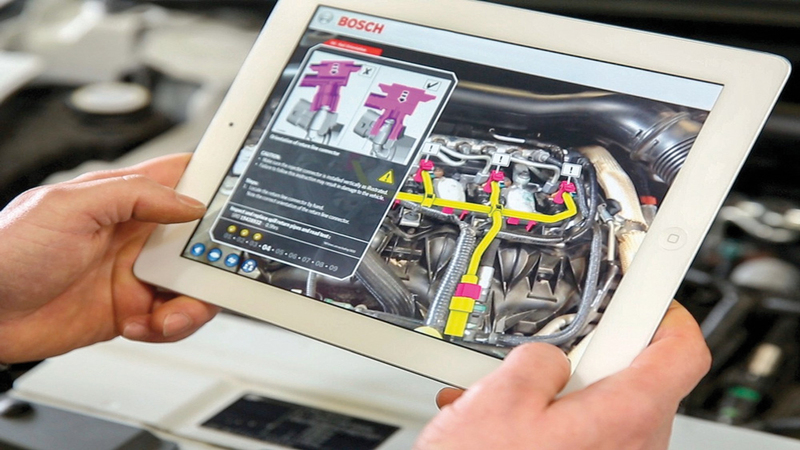 Engineering and electronics company Bosch that have realised the benefits of using augmented reality to train staff, and created their own Common Augmented Reality Platform (CAP) to supply to their automotive consumers. CAP allows the user to access a comprehensive database and extract AR visuals to explain processes. The user can hold their tablet device over an engine and see overlays with written information and explanations, as well as video clips and markers showing them on the real machine what they need to be doing. There are so many ways a business could adapt this evolving technology, and with the advances we are making in augmented reality, we can help our consumers make more informed decisions about the items they are purchasing and therefore boost conversion, and we can limiting the real world risk when training our employees, while providing an engaging method of learning that can be accessed anywhere. These are just two uses for AR in business, but there are so many possibilities that make augmented reality worth considering. Interested in using augmented reality to improve services within your business? Drop us an email at info@sbanimation.com or give us a call on +44 (0)207 148 0526.